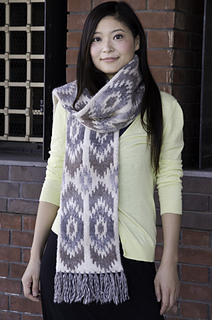 Cilou is a bulky and lush scarf knit in the beautiful shades of Cascade Yarns Eco Duo. The color pattern on the scarf was inspired by the slightly blurry the patterns created when the warp of an Ikat fabric is tied onto a loom. The scarf is knit in the round from the bottom up. A provisional cast on is used so that you can later make a three needle bind off using these cast on stitches. This pattern uses three needle bind off to create a firm edge for attaching the fringe. There are three charts for the colorwork pattern and detailed instructions for adding the fringe. You will need approximately 394 yds of the MC, 287 yds of CC1 and 257 yds of CC2 to complete this scarf. Gauge: This gauge was measured on the scarf. To try and achieve gauge knit a swatch in the round using the color chart.